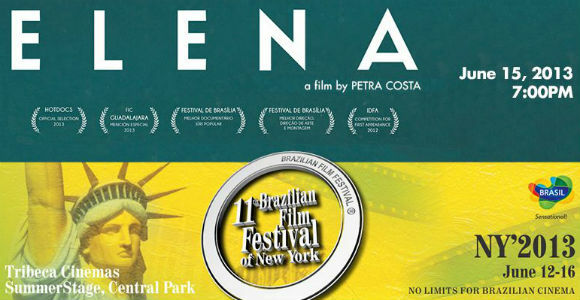 ELENA is screening this Saturday, June 15 at the 11th Brazilian Film Festival of New York. The film will be screened at the Tribeca Cinemas at 7pm (local time). Buy Tickets. ELENA is part of the Competitive Festival, alongside feature films Colegas, by Marcelo Galvão, De pernas pro ar 2, by Roberto Santucci; Rânia, by Roberta Marques; Dossiê Jango, by Paulo Henrique Fontenelle; Margareth Mee e a Flor da Lua, by Malu De Martino, Hoje, by Tata Amaral, Faroeste Caboclo, by René Sampaio, Somos Tão Jovens, by Antonio Carlos da Fontoura e Uma História de Amor e Fúria, by Luiz Bolognesi. The event, sponsored by the Brazilian producer Inffinito, aims to highlight recent successful national productions. The films of the festival are selected by a team of curators formed by cinematographer Walter Carvalho, filmmaker and current president of the Brazilian Association of Independent Producers, Marco Altberg, the marketing manager and project developer for Channel Brazil, André Saddy, the filmmaker and producer, Cavi Borges, and the executive producer of the films from Central do Brasil and City of God, Elisa Tolomelli. The closing concert of the festival, which will take place on Sunday, June 16, will be the Brazilian singer Preta Gil. The presentation will be at Central Park Summerstage. The winners of the 11th edition of the Brazilian Film Festival of New York will be announced on the same date.